Which two famous authors both named their lead characters after rivers? Which classic writer’s name means “restless”? RBTH answers these questions and more. When you read a name in a language you don’t understand, you just see its exotic qualities. For example, new learners of Russian are often surprised to find out that the Bolshoi Theater just means the Big Theater. When it comes to surnames, there are often hidden layers of allusion – and sometimes irony – waiting to surprise the foreign reader. The poet’s name is so well-known that many Russians probably wouldn’t stop to think about its origins, but it actually comes from the 14th century, when a nobleman called Grigory Morkhinin became Russia’s first artilleryman. 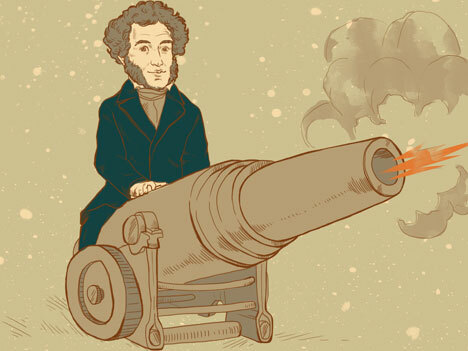 As a result he became known as Pushka – “cannon” in English. The name stuck and a few centuries later his descendent would bring it international fame. Mikhail Lermontov, who comes in at number two on the list of all-time greatest Russian poets, was about 15 years younger than Pushkin. Although his name might seem exotic, it actually comes from Scotland originally. Georg Lermont, the poet’s ancestor, came to Russia in 1613 to serve in the Russian army. The main character in Lermontov’s most famous work, “A Hero of Our Time,” is called Pechorin, which derives from a northern river, the Pechora. He wasn’t the first writer to seek inspiration from a river, however. Pushkin named the eponymous hero of his novel in verse “Eugene Onegin” after the river Onega, also in the Russian north. If we’re talking about famous Russian writers, then Tolstoy is definitely the prose heavyweight in more ways than one. His name comes from the Russian word “tolstiy,” which means “plump” or “thick.” It is likely that the first member of Tolstoy’s ancient noble family was a rather large individual who got a nickname to suit his appearance. Although English-speaking readers know him as Leo, Tolstoy’s first name is Lev in Russian. This makes his choice of the surname Levin for a character in his famous novel “Anna Karenina” quite an interesting one. Perhaps Tolstoy is hinting at Levin’s role as kind of alter ego for the author himself. Russian literary history also features two additional representatives of the Tolstoy clan: Aleksey Konstantinovich Tolstoy, a contemporary of Leo Tolstoy, and the Soviet writer Count Aleksey Nikolaevich Tolstoy, whose loyalty to the Soviet regime earned him the epithet “The Red Count.” The Tolstoy literary dynasty is still going strong today through writer Tatyana Tolstaya. This great writer’s surname has geographical origins: Fyodor Dostoevsky’s ancestors came from Dostoev, a Belarusian town. More interesting, perhaps, is the surname he gives to the main character in his famous novel “Crime and Punishment.” The name Raskolnikov is derived from the word “raskolnik,” which refers to a person who opposed the reforms of the Russian Orthodox Church in the 17th century. More broadly it means a dissenter and also contains the idea of “splitting apart” – as the church did ultimately split at that time. As well as the clear religious allusions, perhaps Dostoevsky is drawing attention to Raskolnikov’s dual nature. This surname dates back to the ancient Russian name Chekh, or Chokh, which in turn relates to the verb “chikhat” – to sneeze. You might get this nickname if you suffered from chronic head colds or sneezed a lot. We don’t know how Chekhov’s patients reacted to the name, but it might have raised a few smiles to be treated by a Dr. Sneezer. In one of Chekhov’s stories, “A Horsey Last Name,” the protagonist struggles to remember an acquaintance’s surname. All he knows is that the name is somehow related to horses, so he makes several guesses – all wrong. It finally turns out that the man’s surname is Ovsov, which is derived from the word “oves” – oats. In the 20thcentury, five Russian writers were awarded the Nobel Prize in Literature: Ivan Bunin, Boris Pasternak, Mikhail Sholokhov, Alexander Solzhenitsyn and Joseph Brodsky. Bunin’s last name originated from the nickname “bunya,” which indicated an arrogant and selfish man. What do Tolstoy, Chekhov and Akhmatova have in common? Alexander Solzhenitsyn’s family name comes from the term for the profession of malt processing. Traditionally, Solzhenitsywould have been “malters” who cultivated and dried malt. In Solzhenitsyn’s most famous work, “One Day in the Life of Ivan Denisovich,” the hero’s surname, Shukhov seems to be a variation of Shukha, the most affectionate Russian nickname for the name Alexander. Just like Tolstoy’s Levin, Solzhenitsyn gives his protagonist a name that has echoes of his own. This subtle self-referential device is a way for Solzhenitsyn to draw the reader’s attention to the autobiographical components of Shukhov’s story. Joseph Brodsky’s name is a typical “geographical” surname which suggests that the poet’s ancestors came from the Galician town of Broda, in modern Ukraine. On the face of it Venedikt Erofeev’s surname comes from the ancient name Erofey. However, it also resembles the word “erofeich,” which is the name of an ancient Russian vodka – so potent that it could knock seasoned drinkers sideways. This is an interesting twist when we consider that the protagonist of Erofeev’s famous poem in prose “Moscow-Petushki” is an inveterate drunk on an alcohol-fuelled journey to a distant village. Alexey Mikheev is a Ph.D. candidate, linguist, philologist, translator.